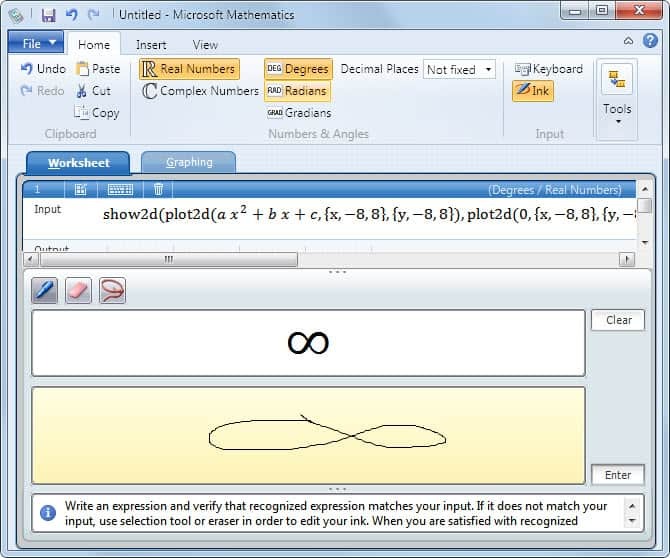 If you enjoy mathematics or science, or currently have to because you are at school or University, then the free Windows application Microsoft Mathematics 4.0 may be what you have been looking for to make your life just a tad easier. The description on Microsoft.com is short but up to the point: "Microsoft Mathematics provides a graphing calculator that plots in 2D and 3D, step-by-step equation solving, and useful tools to help students with math and science studies. 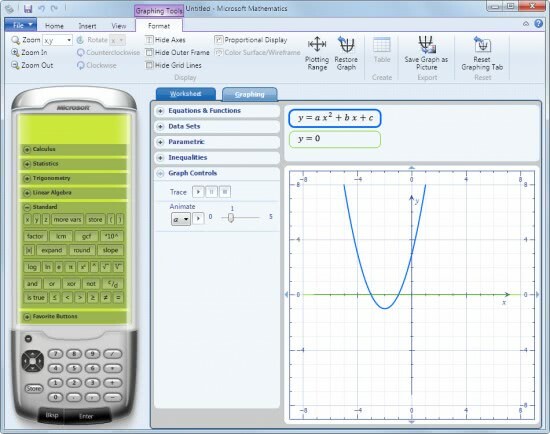 Microsoft Mathematics includes a full-featured graphing calculator that’s designed to work just like a handheld calculator. Additional math tools help you evaluate triangles, convert from one system of units to another, and solve systems of equations.". Performing matrix and vector operations, such as inverses and cross-products. Computing basic statistics, such as mean and standard deviation. Finding, plotting, and solving common formulas and equations. The software uses the standard Microsoft ribbon interface that is also used in Microsoft Office and other Microsoft applications. Users can start entering expressions right away which are then processed and solved by the application automatically. A mobile phone like calculator on the left side contains elements and options that can be added to the expression, helpful if the element cannot be entered via the keyboard. One interesting option is the ink mode which can be used to write elements with the mouse. Microsoft Mathematics displays two tabs (Worksheet and Graphing) which show the input, output and a visual representation. The application comes with additional tools including an equation solver, formulas and equations that can be viewed and used, a triangle solver and unit converter. The application comes with a help file that explains the functionality in detail and with examples. Microsoft Mathematics is available for 32-bit and 64-bit editions of the Windows operating system. It requires the Microsoft .NET Framework 3.5 SP1. I really like this free (unbelievable) program from Microsoft i am working now a few day’s with it and it’s obviously not that elaborate as main Hewlett Packard 41c, but the graphs are better. In those good old days I never even used a scientific calculator, everything was done like it still is in some siberian airportd: pencil & paper ! Pay attention to a bug. In the graphs plotted, the Y-axis is not at the center of graph. You may easily notice that Y-axis does not match the grid lines in the graphs output. I hope there will be a patch soon for this bug. Thanks for the info. It’s little tid bits like this that I constantly monitor Ghacks. Too bad I UNinstalled all traces of ,NET from my PC. (too many security vulnerabilities in .NET). Any suggestion for other similar calculator programs?